If you think the combination of fresh orange juice, peach schnapps and booze is refreshing, then this delicious frozen revamp of the classic fuzzy navel cocktail will get you excited. Nearly as yummy and sweet as a smoothie or shake, this frozen cocktail is a great drink that will have you feeling fresh on a hot summer day. Whether you’re getting a tan or just chilling by the beach, this drink will help keep your cool amidst the scorching heat. While summer is all about barbecues and ice cream, it won’t be complete without our favourite cocktails and mocktails. Have it frozen and blended, and your booze can even be more refreshing than just being iced. Try it at home whenever you feel like drinking something fuzzy and sweet yet light with a kick. 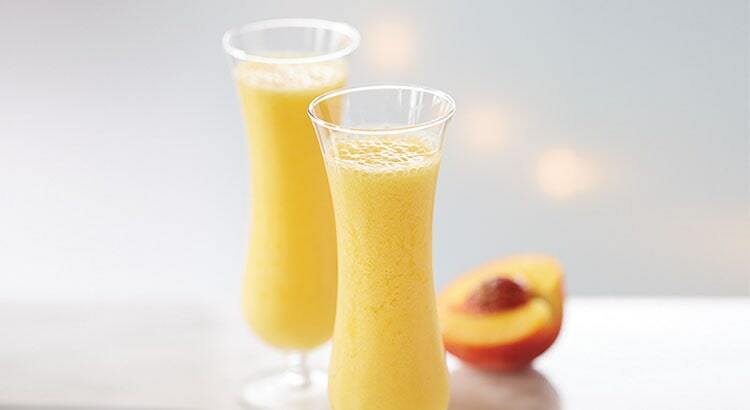 Perfect for beach parties or simply for Summer dinner by the garden, this blended smoothie-like version of the classic fuzzy navel is a must-try. Place all ingredients into the Vitamix container following the order listed above then secure the lid. Select variable 1. Turn the machine on and slowly increase the speed to variable 10, then to high. Recipe and image in this article were adapted from Vitamix.